Delivery of bulk mulch our variety includes, Designer Mulch,$29.50 Per Yard available in, Black, Chocolate Brown, and Red. Leaf Mulch The Best Mulch for Your plants $16.50 "
Triple Shredded Hardwood Bark Mulch $26.00 and our Budget Cutter mulch which offers an lower price at just $18.00 per yard. aged Pine Bark Fines and Long Needle NC Pine Straw. With a knowledgeable background of mulch since 1998, we at Area Mulch and Soils enjoy helping you decide what type of mulch you need. Use Our Product Calculator to find out how much mulch to order. 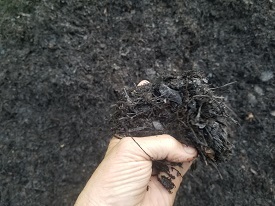 Leaf Mulch: Black in color, Images shown is leaf mulch is aged 3-4 years old. It holds color very well and does not fade. Leaf Mulch as it ages turn closer to pH neutral, it the will not burn. It is our most recommended mulch for first time mulching of flower gardens. We highly recommend it, because it breaks up clay soils here in Raleigh and adds more nutrients compared to other mulches. It holds moisture the best of all mulches, does not get hard in bottom layers. It is has very high nutrient content and adds 70-90% more nutrients to your plants than traditional mulch. It adds the most microbial life to your soils of any groundcover mulch. One advantage of leaf mulch, is that after one year, plants can grow directly in the mulch. Note, may contain small pieces of trash try the leaf mulch and you will see a positive difference in your plants with it. Playground Mulch ASTM Certified: 1/4 - 1/2 inch in size. Its made from shredded hardwood. Lay 6 inches deep and your is safe for a 3 foot fall in most cases. The type of Mulch meets the Nation Guild-line standards for impact Attenuation. Triple Shredded Hard bark: Color darkens with age, it is made from a variety of hardwoods, and is resistant to water erosion and wash out. A great choice for weed prevention and contrast well with green grass. This mulch will last approximately one year. Not Recommended for playgrounds. Decorative Designer Hardwood Mulch: Colors available are Black, Chocolate brown and Russet Red. Our Budget Cutter: A basic mulch made from a mix of aged hardwoods and soft woods this mulch this year is black in color. Quickly coming the cheaper mulch to use here in Wake County. Some types of Mulches actually can provide nutrients like our Aged leaf Mulch. Some mulches are all ready full of microbial life, like our aged Leaf Mulch. When applying 2-3 depth no more than 3 inches. Don't put mulch right up to the stem of plants and shrubs there by making a habituate for mice to gnaw on your plant stems when it's cold. Getting the most bang for your buck when using stained wood mulches if applied at least 3 inches deep, as it fades, simply roll it over for another 8-10 months of color. Warning To much mulch can cause root damage. Rock mulches put deep next to your foundation has in fact cause more termite damage than mulch. Termites don't like pieces of bark they like logs, large pieces of wood. Moisture is the main problem termites love moisture. NC State has done research on this very subject.